The City Square Mall in Johor Bahru is the newest mall which is also closest to the Johor Bahru ( JB) Immigration checkpoint. After clearing the JB’s immigration which by the way took more than an hour of queuing to get my passport stamped, I decided to head to the City Square Mall. If you are planning to go to Johor Bahru by bus on the weekend or on the eve of public holiday, be prepared for a long and tedious queue at the JB’s Immigration checkpoint. Bring along a bottle of water, it is totally humid, crowded and chaotic inside the Johor Bahru’s checkpoint building. There is no proper lanes for visitors to queue, so many people jump queue. I can see children crying, a woman ahead of me fainted, a cute toddler vomited on the floor just beside me and I saw the faces of many frustrated visitors. Come on Malaysia Immigration department, heads up and get your act together to provide quicker and more efficient service to visitors. The air-condition in the building don’t worked and it is oven temperature with so many visitors in there. They could certainly take a lesson from Singapore Immigration, where I cleared it in less than 10 minutes. When you finally get out of the JB immigration checkpoint, you can see an underground pedestrian walkway straight ahead. Just use this walkway and continue to walk straight. There are lots of touts asking you where you are going, just ignore them and keep walking. You will pass by shops, Merlin Tower, a petrol kiosk and again rows of shops. When you spot a large modern building, that is City Square Mall. This mall has a strategic location and is also opposite the grand old Johor Railway station. The mall has 5 levels of shops as well as a cinema which is on the highest level. I can see plenty of stores selling clothes and fashion accessories. 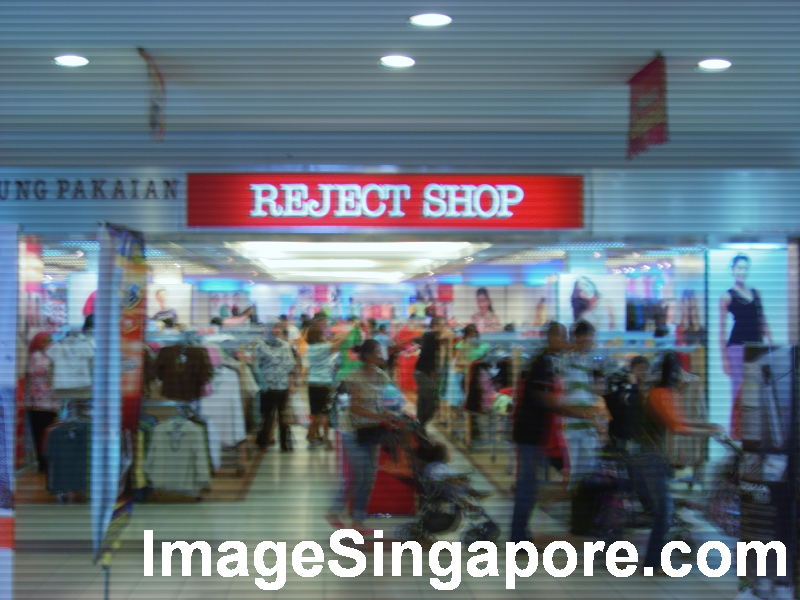 One of my favorite clothing store is the Reject Shop. It is a store that sells branded clothing at a discounted price. The clothes there may be off season or with some quality issue, but it is worth the value. There are plenty of restaurants and small food outlets to choose if you are hungry. One of my favorite is the MacDonald restaurant – this place is spacious and of course a Big Mac is cheaper here than in Singapore. City Square Mall has a good crowd especially on weekends. You can see lots of Singaporeans coming here to shop and eat. The Management could improve its service by providing more signage to guide shoppers. Signage should be placed to help visitors locate the link bridge, the major anchor stores such as Watsons and the restrooms. I am rather disappointed that the management of this mall imposed a 20 cents charge for using the restrooms ( toilets). Firstly this is a outdated practice and secondly, if you are operating a mall, providing clean restrooms is imperative and a basic necessity for the shoppers. In the restrooms, the taps are automatic sensor taps that dispenses water when you placed your hand under the tap. That is good, but unfortunately some of these taps stopped working – so you see people queuing up to use the remaining taps that still worked. I don’t have the time to browse through the many shops that are in the mall. I will certainly make some effort to go back there again. Perhaps I will choose to go there on a weekday instead when it is less crowded. There are food outlets that I want to try and perhaps even catch a movie if I can find the time.